BANGI, 17 July 2014 – The phenomena of homelessness cannot be overcome unilaterally by removing them from upmarket areas of the country’s cities but should instead be handled at its roots. A forum in the Bicara Bangi series discussed the topic Homelessness In Cities – Conflict of Responsibilities? organised by The National University of Malaysia (UKM) agreed that the authorities should look at problems faced by the homeless rather than looking at them as a problem. Participating in the series of Bicara Bangi forum at Persada Canselori here today, the speakers agreed that no single solution to house or shelter them can ever be achieved if certain stereotypes about them persisted. 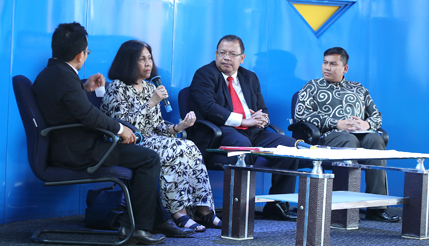 The panelists were UKM Vice-Chancellor Professor Dato’ Dr Noor Azlan Ghazali; founder of PERTIWI Soup Kitchen Munirah Abdul Hamid and Dr Mohd Suhaimi Mohamad from the Faculty of Social Sciences and Humanities. It was moderated by RTM presenter Sayed Munawar Sayed Mohd Mustar. Deputy Secretary General of the Urban Well-Being, Housing and Local Government Ministry Dato’ Halimi Abdul Manaf who had earlier confirmed participation declined to take part at the last minute. Prof Noor Azlan set the tone of the discussions when he referred to the recent uproar over a deadline to ban soup kitchens from Bukit Bintang, Kuala Lumpur given by Federal Territories Minister Datuk Seri Tengku Adnan Tengku Mansor which shocked the public over the presence of homeless people actually living on the fringes of society. The news had raised awareness about the plight of the homeless and triggered massive public sympathy for the vagrants. Prof Noor Azlan praised the soup kitchen activists for sticking to their guns and rallying the public to support them through social media to pressure Kuala Lumpur City Hall to defer the decision until after Hari Raya. He said though homelessness is still quite small and not a major problem he hinted that such aid to the homeless could not go on indefinitely advising the NGOs to form teams to deal with the dispensing of food only as a short term measure. “There has to be innovation in the actions to resolve the problem as permitted under Islam and the syariah. There will come a time when we have to stop giving,” he stressed. He was concerned that homelessness could be caused by the disintegration of the family as an institution. Munirah, who founded PERTWI four years ago, said the authorities should avoid taking action on the vagrants without consulting the homeless themselves and the NGOs about how best to deal with the issue without causing more harm. Part of the problem was that the authorities confused the homeless with beggars. They are not beggars but are struggling to make ends meet, she said. She disagreed with the authorities’ view that giving them food would make the homeless ‘lazy’. Munirah, who runs the Pertiwi soup kitchen that provides meals, basic medical care and haircuts for the homeless, explained that even odd jobs like selling recyclable items gave the homeless more money in their pockets compared to full-time work like factory hands that imposed various salary deductions. Many street people have mental and physical illnesses, others are victims of abuse or are from troubled backgrounds, some have drug or alcohol addictions, she said. There are also ex-convicts, the elderly and impoverished folk and people identified as lesbian, gay, bisexual or transgender, she added. Their troubled backgrounds and the way they have been forced to live make it impossible for many street people to hold down ordinary jobs. “They can’t do a nine-to-five job. They can only work twice a week or half a day because of their short attention span,” she said. “There are people who are not fit enough for work because they’ve been on the streets for so long. They’ve got all these ailments, so they’re not fit. All these cases fall outside the government structure,” Munirah said. Dr Mohd Suhaimi – a researcher – spoke about the difficulties of helping the needy based on his personal experiences saying that not all of them want to comply with regulations when they are approached to be given assistance. He had met some of them who became homeless because of incidents in their lives such as failure to manage their personal finances, dysfunctional families, domestic violence, health problems and retrenechments. He said many of them become homeless because they were rejected by society where they lived due to their unconventional lifestyles. He acknowledged that it was getting harder to make ends meet in Kuala Lumpur where an income of RM900 a month is actually living below the poverty level even for a single person.